Character is how you see yourself. Reputation is how others see you. Want to know what they think? Rannko is a 5 ⭐️⭐️⭐️⭐️⭐️ user-friendly, online reputation management platform that enables marketers and business owners to save time managing their digital presence. Our services include Review Management, Smart Menus, Social Media, Task Manager, PowerListings and more. Would you like to log in and see a live demo? Rannko Pro Deluxe gives you access to our entire product range at an incredible discount. Modular is positioned for you to only pay for what you want to use. Need some visuals? Us too! Check out our product intro's. How can Rannko help you? Make maintaining an online presence and interacting with your customers simple and easy with Rannko Review Management. Rannko inspects your website for those opportunities and reports them straight to you so you can take the steps optimize and own your digital presence. For multi location businesses and franchises. Have ultimate control from the single location to the location manager. 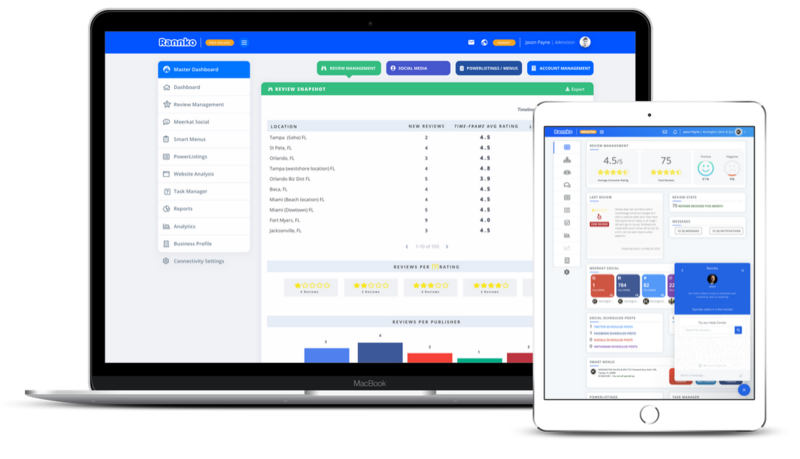 Use Master Dashboard to leverage the power of reviews, Social Media & Powerlistings. Have ultimate control to build a spotless reputation across multiple networks. Whether one account or one hundred, never pay an onboarding fee with Rannko. Multiple locations? We have you covered! Rannko offer highly competitive pricing with your business growth in mind. Share a quote with us, and we will do our best to beat it!